Crochet yourself cool with fashionable sleeveless tops that will fit your style! Crocheted fashion isn't just for cold weather with the 21 refreshing designs in this book, perfect on their own or as layers. 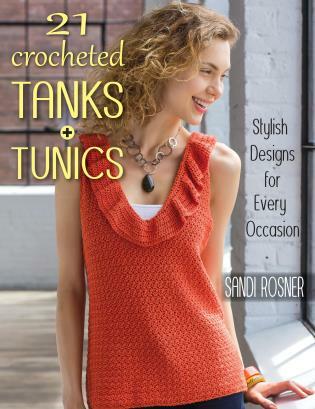 Sandi Rosner has worn many hats in the knitting and crochet business--yarn store owner, designer, technical editor, teacher, and producer of the Public Television series Knit and Crochet Now! She puts all that experience to good use in her current job as Creative Director of Premier Yarns. Sandi lives in Charlotte, North Carolina.